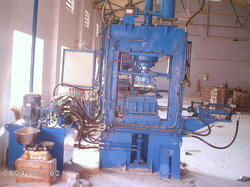 We are a leading Manufacturer of brick machine for construction industry from Coimbatore, India. Under precious guidance of our skilled professionals, we are engaged in offering a quality approved range of Brick Machine for Construction Industry. Our offered brick machines are accessible in various specifications to choose from. The offered brick machines are developed with leading techniques and quality-proven material in sync with the set standards. Also, we are giving these brick machines to our customers at nominal rates. Looking for Brick Machine for Construction Industry ?